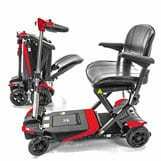 If you’re an elderly person, or perhaps you’re looking to buy a mobility scooter for someone within your family who is older. Then there are some key things to consider while searching for that perfect senior scooter. In order to aid you in your search, we’ve spent a good 34 hours filtering the available models down to the 5 best mobility scooters suitable for seniors. You can check their individual strengths and weaknesses within our reviews at the bottom or you can check the comparison table which gives you a good overview of what might model might be the best fit for your needs. The easiest mobility scooter you’re ever going to handle. Does the elderly scooter you are looking at have a delta tiller or a normal handlebar? 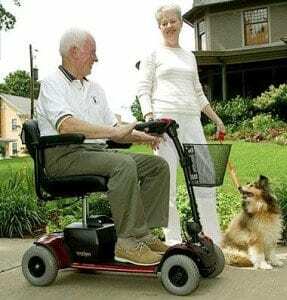 For some seniors arm & upper body strength and dexterity could be lacking, therefore you should look at mobility scooters with a delta tiller instead of the old handlebar. Delta tillers are designed to ease maneuvering even though you lack upper body strength. This makes for a more comfortable ride and eliminates the chances of them losing steering control. 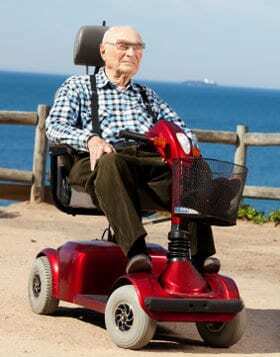 Choosing the right mobility scooter that has a chair with swivel function could erase this problem due to the fact that they can turn the chair in order to mount and dismount easily. Picking one with a height adjustable chair is also a great way to ensure that they can get on and off. They can then lower the chair making it easier for them to get on/off the scooter. Something that is even more important is that the elderly person who is to use the mobility scooter is able to handle it themselves. These mobility scooters main purpose is to allow them to do things easier, picking a heavy scooter which has a complicated folding mechanism might not be appropriate. Try to find one that has a low total weight and an easy folding mechanism, some scooters even fold automatically with the push of a button like the Solax Transformer. Most scooters do not have too complicated folding mechanisms, but their weight varies heavily. Find something that can be dissembled into 2 or more pieces, this can aid the elderly person while loading it into the back of their car trunk or storing it away at home. The ability to disassemble the mobility scooter into various pieces will make a heavy scooter much easier to transport. A scooter dissembled into two pieces gives you two light lifts instead of one heavy lift. The Solax Transformer is the only scooter with automatic folding. It comes with a remote control, with the push of a single button it folds and unfolds automatically making it our number one choice as a senior scooter. It’s lightweight and easy to operate, has a comfortable seat with flip-up armrests for easy mount/dismounting. The Smartscoot is as lightweight as a scooter can get. It has a unique design with an easy folding system that makes it take up very little space in the back of your car. In fact, it folds together so tight that it might even fit in your closet. It’s therefore very easy to store in your home. The Go Go Traveler is available both as a 3-wheel and 4-wheel mobility scooter giving you the option to choose what would suit your needs the best. The only difference between them are; 4-wheel option has lower distance per charge, a wider turning radius, and better stability. It has Pride Mobility’s fether-touch folding system that should allow you to fold the scooter with one hand and within less than 60 seconds. This scooter is a favorite among travelers and those who like going on cruises where long distances might hold an elderly person back from enjoying everything the cruise ship has to offer. We would have loved a bit more ground clearance for the sake of it, but it does get over most thresholds. I can tell you that every list we make Drive Medical’s Scout is there as a top contender. Not due to its fantastic features, even though it has some great features. No its mostly due to the fact that their price tag on the Scout is so low that we have to include it. For a little over $600, you get a decent mobility scooter. It’s not groundbreaking but it does the job. The Scout is available in both 3 and 4-wheel setup leaving the choice to you. Both of them have always been best-sellers and they are highly appreciated by their previous buyers. If you read our full reviews of it, you will understand what we’re talking about. It’s a mediocre scooter that gets you from point A to B without problems. It does, however, weigh a bit more than the more portable options above and therefore might not be the most suitable choice for a senior. Even so, many people of age have used it before you, and many will do so in the future. That’s how priceworthy they are. The Go-Go Ultra X is another cheap scooter, this time from Pride Mobility. It is available in both a 3-wheel and a 4-wheel setup which leaves the personal choice to you. As stated earlier the biggest difference between a 3 and a 4-wheel scooter are stability and turning radius. This is another famous scooter and they often get compared with the Scout from Drive Medical. Many who choose to go with Go-Go scooters gets spoiled by the comfortable seating, its small size and the light weight of each piece. When disassembled the heaviest piece weighs only 28lbs making it a great scooter to take with you on travels, or to visit family and friends. 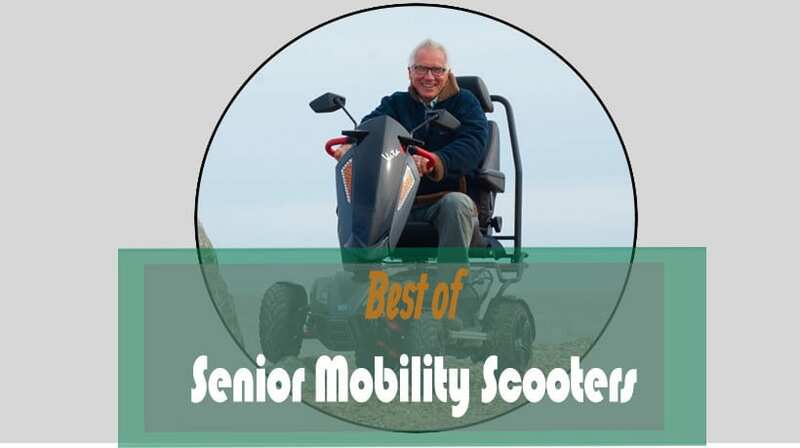 It is our hope that this article will help you in your pursuit of finding the best suitable mobility scooter for you or the elderly person who it’s intended for. When choosing a scooter for a person of age you have to understand the needs of that person. Going for the most expensive choice isn’t always the best idea, especially if it is going to be used to aid the person while indoors and just going for small errand runs. Then one of the cheaper scooters might be just what you are looking for. Likewise, if they love the outdoors none of these will get the job done perfectly and you should opt-in for one of the sturdier off-road models, these can easily take you anywhere you’d like to go, but have a hard time getting to by yourself.